Trilliums are members of the lily family. They comprise about 40-50 species. Typically relatively small forest-dwelling plants, they are usually found in the shade or in dappled sun. 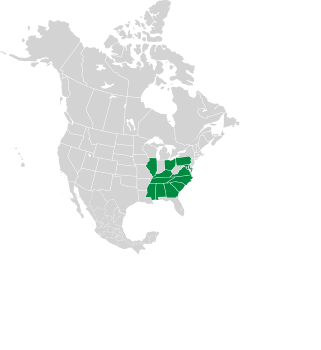 The genus Trillium means “three”—trilliums do most everything in threes, from the whorl of three leaves atop each stem, to the three bracts (modified leaves) below the flower, to the three-petaled flower. Take a look at this photographic overview of trilliums, or use the table below to help identify your specimen. Plant Plants have one to five round stems, and are up to 15" (38 cm) high. 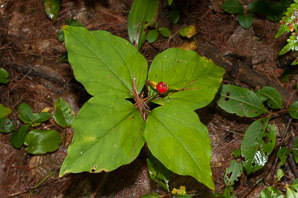 Plants have one to two round stems, are 12-24" (30-60 cm) high, and are found on forest floors. A whorl of three leaves forms atop each stem, each leaf facing straight upward, with a single flower emerging from the center. Plants have 1-4 round flowering stems, 6-16" (14-40 cm) tall. A whorl of three leaves forms atop each stem, each leaf facing straight upward, with a single flower emerging from the center. The flower is connected directly to the leaves. Flowers Flowers are green streaked with deep purple, or pure purple, turning darker with age. They are 1-2" (2.7-6 cm) around and ¼-½" (7-13 mm) long, and have a faint, usually pleasant spicy odor. Usually maroon, but may also be a brighter red, white, or greenish yellow. They have three true petals and three petal-like bracts, arranged to look like a six-petaled flower. These flowers are sometimes called stinking benjamin or stinking willie because they smell like a wet dog. The odor attracts flies that pollinate the plants. The flower is erect, looking a little like a candle flame, ¾-1¾" (2.2-4.7 cm) × ~⁵/₁₆" (8-9 mm), and smells like lemons. Three small specialized leaves (“bracts”) lie flat below the flower. Leaves Each plant has a whorl of three leaves, each leaf facing straight upward, with the flower emerging from the center of the three leaves. Leaves are 2½-7" (7-18 cm) × 2½-5" (7-13 cm), green mottled with pale green, roughly oval or diamond-shaped, wider at the bottom and tapering somewhat at the top, with even edges. Oval or diamond-shaped in shape, wider at the base, tapering to pointed tips, and with even edges. Leaves are oval in shape, 2½-7" (6.5-17 cm) × 2½-3½" (6.5-9.8 cm), wider at the base, tapering to pointed tips, and with even edges. 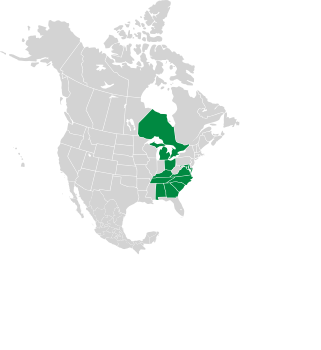 Fruit Green or with purple streaks, oval, with odd angles or flattened areas, ¾" (2 cm) × ⅜-½" (1-1.5 cm). Fruits are dark maroon in color, smelling faintly of fruit, rounded to slightly pyramid-shaped, ⅜-½" (1-1.5 cm) around. Fruits are green to greenish white, occasionally with dark streaks, roughly oval, 6-angled, 1¼" (3.5 cm) × ¾" (2 cm). Plant Plants are 4-16" (11-40 cm) high, with dark greenish or maroon stems. A whorl of three leaves forms atop each of the 1-3 stems, each leaf facing straight upward, with a single flower emerging from the center. Plants have one to two round stems, and are 12-26" (30-65 cm) tall. 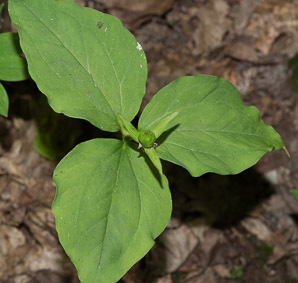 Three leaves form a whorl atop each stem. Flowers One flower per stem, elevated above the leaves, with three conspicuous white petals tinged with pink near the centers, and large yellow stamens. Each petal is about 1-1½" (2.5-3.8 cm) long and ½-¾" (1.3-1.9 cm) wide. 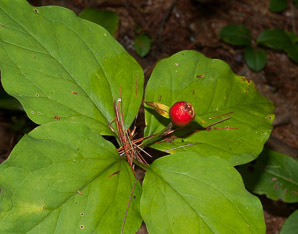 While the flower appears above the leaves in many species of Trillium, these droop below, on a short petiole. Each flower is maroon (rarely yellow) in color, with three petals, 1-2½" (3-6.5 cm) × 1½-2" (4-6 cm). Each flower has a mild sweet odor. Leaves Oval or diamond-shaped in shape, wider at the base, tapering to pointed tips, and with even edges, 4½-7" (12-18 cm) × 3-8" (8-20 cm). Almost triangular, sometimes wider near the base than they are long, 4-8" (10-20 cm) × 2-8" (6-20 cm) in size. Fruit Fruits are ⅜-¾" (1-2 cm), roughly pear-shaped or shaped somewhat like a prism, and scarlet in color. Dark reddish maroon, generally oval but sometimes with flattened sides, ⅜-½" (1-1.4 cm) × ⅜-¾" (1-2 cm). 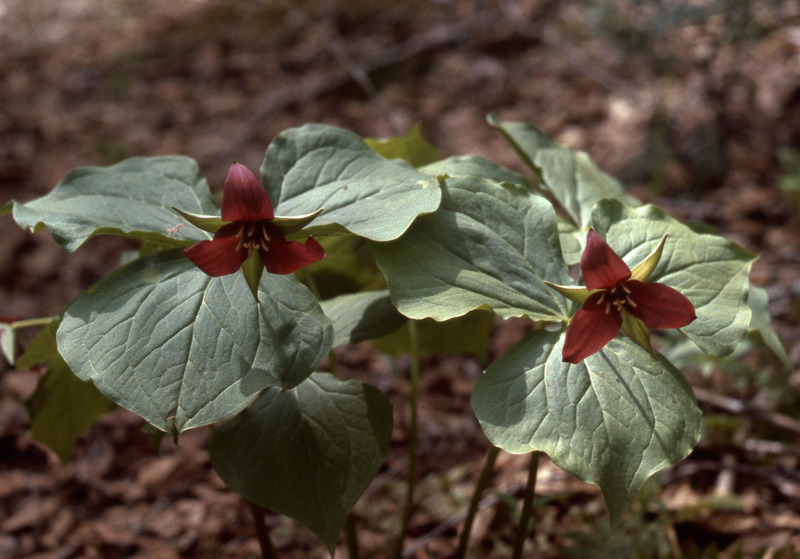 Trillium description by Thomas H. Kent, last updated 12 Oct 2018.